While that’s $540 more than the 2019 Pilot, the Passport eschews a traditional base model and instead begins with a generously equipped Sport variant. 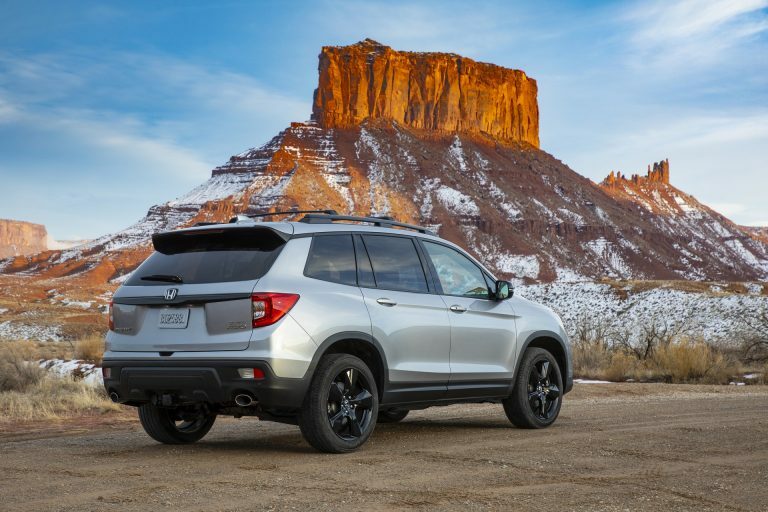 According to Honda officials, this was done because the company believes buyers will be relatively affluent and don’t want a stripped down crossover. As a result, the Sport comes nicely equipped with LED headlights, LED fog lights and LED brake lights. Buyers will also find rear privacy glass, remote start and standard 20-inch wheels with a gloss black finish. The interior is well appointed as the Sport has a tri-zone automatic climate control system, a five-inch infotainment system and a seven-speaker audio system with a subwoofer. Other highlights include a push-button ignition, a tilt / telescopic steering column, a multi-angle rearview camera and 60/40 split rear seats which fold down at the press of a button. Despite its entry-level status, the Sport comes equipped with adaptive cruise control, collision mitigation braking and a road departure mitigation system. Other features include a forward collision warning system, a lane departure warning system and lane keeping assist. 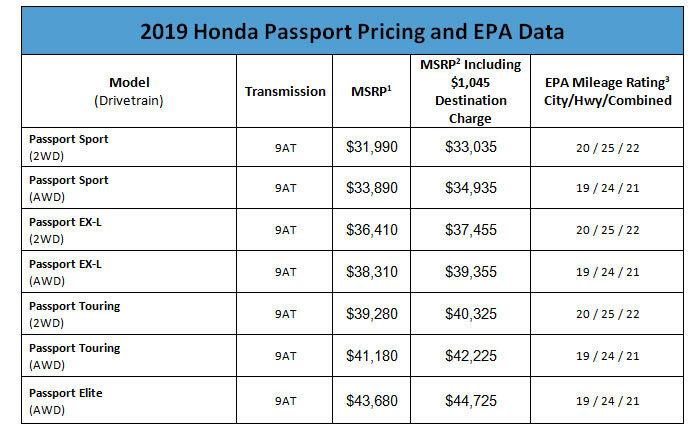 The Passport EX-L starts at $36,410 and Honda expects around 50% of customers will opt for this model. Key exterior highlights include an acoustic windshield, a power moonroof and heated side mirrors with integrated LED turn signals. The EX-L also boasts a power liftgate and 20-inch wheels with a pewter gray finish. Moving in the cabin, drivers will be greeted by a leather-wrapped steering wheel and heated leather front seats. Speaking of the latter, the driver’s seat has 10-way power adjustment while the front passenger seat only has four-way control. Those aren’t the only interior highlights as the EX-L has an auto-dimming rearview mirror, HomeLink and an 8-inch Display Audio with Android Auto and Apple CarPlay compatibility. Other features include illuminated front vanity mirrors, a rearview camera with dynamic guidelines and a blind spot information system with cross traffic alert. The luxury oriented Passport Touring starts at $39,280 and comes equipped with an assortment of additional features. These include ambient interior lighting, illuminated front cup holders and heated front / rear seats. Other niceties include GPS navigation, a 115 volt power outlet and a 10-speaker premium audio system with a subwoofer. The Touring also boasts an assortment of exterior upgrades including roof rails, a hands-free power liftgate and acoustic glass for the front and rear doors. Last but not least, there are power folding side mirrors and front / rear parking sensors. As the name suggests, the Passport Elite sits at the top of the range. Costing $43,680, the crossover has a heated leather steering wheel and perforated leather front seats with heating and ventilation. Other upgrades include rain-sensing wipers, auto-dimming side mirrors, LED map lights and a conveniently located wireless smartphone charger. Regardless of which trim level is selected, all 2019 Passports are powered by a 3.5-liter V6 engine that produces 280 hp (208 kW / 283 PS) and 262 lb-ft (354 Nm) of torque. It is connected to a nine-speed automatic transmission which can be paired with an optional all-wheel drive system. The latter is a $1,900 option on all models except the Passport Elite which includes it as standard equipment. 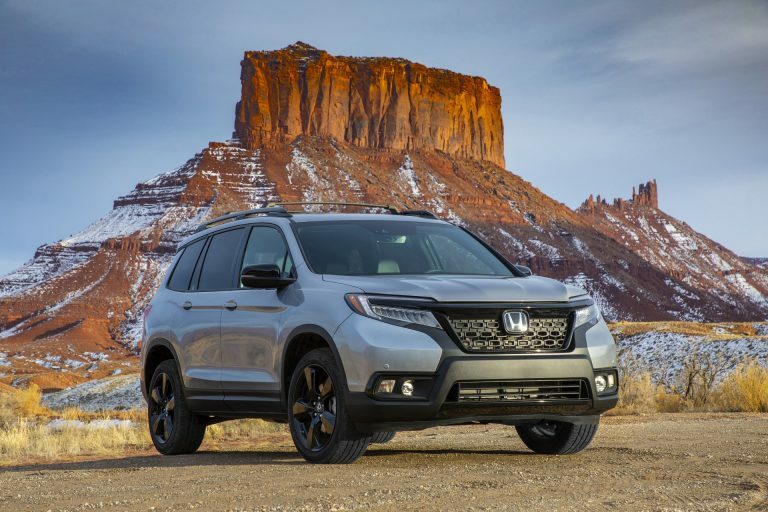 The 2019 Honda Passport will go on sale on February 4th and the company says the crossover costs thousands of dollars less than competitively equipped models such as the Chevrolet Blazer, Ford Edge and Nissan Murano.